A research team at University of Illinois, with other academic and national lab colleagues, has received a $3.2 million grant to study bioengineering sugar cane and sorghum to produce oil for biofuels. The Department of Energy funding for this project also supports researchers at University of Florida, University of Nebraska, and the Brookhaven National Laboratory, with proof-of-concept results expected in 18 months. The team led by Illinois crop sciences professor Stephen Long aims to adapt advances in biotechnology and computer modeling to produce higher-yielding sugar cane and sorghum crops that can be used in the production of biodiesel and jet fuel. The research also plans to develop varieties of these plants that can tolerate cold weather — especially sugar cane — as well as become more photosynthetically efficient. Earlier work with plant-based biofuels was aimed at producing sugars for fermention into ethanol. That process has run into some difficulties, including the inability of current car engines to handle fuel blends with greater than 10 percent ethanol without modification. The process under study, however, is taking a different approach: use the plants to produce oil, not sugar. “We are proposing to subvert that mechanism in the plant to, instead of making sugar,” says Long, “use the products of photosynthesis to make oils and deposit those in the stems.” The natural oils in plants are known as triacylglycerols, which can be converted into diesel and jet fuel by a chemical process called hydro-treatment. Sorghum and sugar cane are not by nature big oil-producing plants, but they are highly productive in producing sugars. Long’s team aims to build on previous studies that identified genes for enhancing oil production in plants and genes that boost their photosynthetic efficiency. 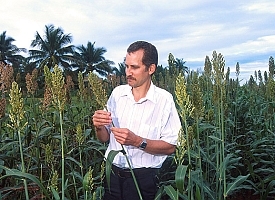 He believes these enhancements could feasibly result in sugar cane and sorghum that produce more than 10 times the amount of oil per acre of natural oil crops such as canola and soybean. Another part of the research is expected to increase the cold tolerance of sugar cane, and thus make the crop worthwhile for growers in more parts of the country than those with warm-weather climates. Long’s team aims to adapt genes from the Miscanthus plant, a perennial grass already used as a biofuels feedstock, varieties of which grow in temperate climates. Yet another task in the project will investigate the engineering of bacteria to produce diesel directly. Once that process is developed and made efficient in bacteria, the researchers aim to transfer the important genes from the bacteria to sugar cane and sorghum.